Hotel Holiday Beach is a 2-star family run hotel located on the seafront of Torre Pedrera. It offers its guests a long list of services and amenities including free parking, WI-FI everywhere, air conditioning and well-kept home cooking. No pets allowed. The hotel is located in Torre Pedrera on the seafront, on the road that runs along the beach. A few minutes by car is the theme park of Italia in Miniatura. The historic center of Rimini can be reached in just 15 minutes by car. Equipped with balcony, air conditioning, digital terrestrial TV, WI-FI, safe, minibar, private bathroom with shower, hairdryer and complimentary toiletries. Panoramic rooms have a sea view from the balcony. Room cleaning is done daily. Open-air porch equipped with chairs and tables, lift, bar area, newspapers in consultation, evening aperitif and free bicycles. PARKING: unattended in the hotel or alternatively guarded and located outside the hotel, both free and available (subject to availability). AIR CONDITIONING: fully air-conditioned and heated. BREAKFAST: rich sweet and savory buffet with croissants, homemade cakes and ring-shaped cake, jams, chocolates, fresh fruit, juices, meats and cheeses. Drinks are served directly at the table. LUNCH AND DINNER: guests can choose between different menus: meat dishes, fish, homemade pasta, romagnola recipes and international classics, accompanied by a vegetable buffet. OTHER: every evening an aperitif is set up. In hotel: outdoor playground area, pediatrician on request. At meals: bottle warmer, seats at the table. 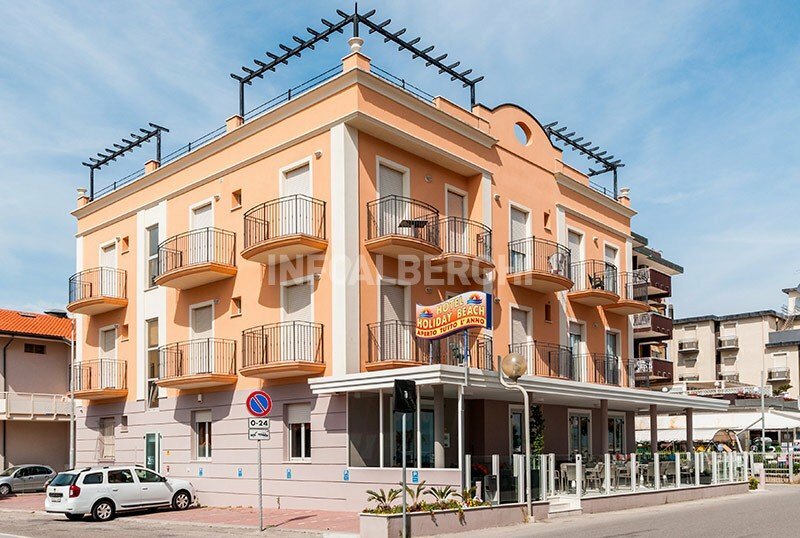 The hotel has an agreement with the nearby establishments n. 58, 59 and 60 equipped with beach umbrella and sun beds rental, cabins, playground areas for children, entertainment for adults and children, bathrooms with changing tables, relaxation area with gazebo and playgrounds. The list prices are per person per day for a min. of 3 days, min. 2 adults in Standard Room. TOURIST TAX: included in the price list. HALF BOARD PLUS AND FULL BOARD PLUS: drinks included with meals.